Asus MG279Q is the successor to the popular Asus MG278Q which had a TN panel. The Asus MG279Q is one of the highest rated gaming monitors in its price range, even after having a limit on the Freesync and a resolution that isn’t exactly the best in the market. How, you ask? The answer lies in a unique combination of things that collectively make this monitor one powerful gaming unit. Let’s deep dive into what makes the Asus MG279Q one of Asus’s best creations in the $400-600 price range. The display, a stand, a power cable, a Quick Start Guide, a mini Display Port cable, an HDMI cable, and an upstream USB cable, a support CD and the warranty card. First and foremost, let’s discuss the gaming power of the Asus MG279Q. The 2,560 x 1,440 IPS display has a good native resolution and is fully capable of handling high frame rates at high speed. And while this is not exactly the best resolution out there even in a similar price range, it will do just fine with Freesync and a 144Hz refresh rate. The display is designed to produce the best quality images. The static contrast ratio of the monitor is 1000:1, the dynamic ratio being 100 million:1. Pair that up with a 16:9 aspect ratio on a pixel pitch of 0.233 mm, and you have highly detailed output images and video content (regarding pixel sharpness and color sharpness). The color reproduction takes care of generating the images in the best possible way. The 16.78m (8-bit) colors in the monitor can utilize the color spectrum in the most detailed manner, reproducing accurate blacks, whites, and grays. The color gamut is ~sRGB, ~72% NTSC, which is pretty much standard and can allow designers or content creators to see good results on it as well. Now after all of that comes the speed and input lag. A 4 ms gray-to-gray response time eliminates that when coupled with a 144Hz capability. You also have video outputs for convenience purposes on the display; we will discuss the later on. The only ‘downside’ here is that there is a 90Hz limit on the FreeSync use. The basic gaming statistics of the display are top-notch. And while they aren’t exactly the best in the market, we have a clever implementation of some add-on features here, which makes things easier. Let’s talk about the add-ons that allow a lucid, hassle-free gaming experience, putting this display ahead of many monitors with a better native resolution than this one. Asus has implemented some technologies just for the sake of making the gaming experience as best as possible. Having a timer and a preset overlay that you can tweak is a lot of value for money. Highly useful in first person shooter games, the overlays can be tweaked for maximum smoothness in the motion output. Asus adds timers or crosshair overlays to your game so you can ensure the raid goes smoothly or no-scope with the best of them. Preset display modes specially tailored to different game genres enhance visuals for the best gaming experience. This makes you create a gaming environment that best suits your personal needs, and that you like the best in appearance. With Ultra Low Blue Light and Flicker-Free technology, gaming marathons remain comfortable for your eyes. 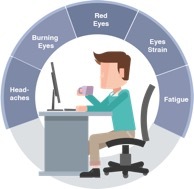 The EyeCare is basically a name given to the implementation of a lot of different features that serve the same purpose – reducing eye fatigue and protecting it from the harmful spectrum of emitted light. Blue light can cause eye fatigue and other issues related to it when viewed for longer durations or in the night time. As it has a wavelength that is very close to that of the UV rays, it is imperative that it is eliminated, and the color is reconstructed using a combination of lights. This is done in the Asus MG279Q display. This WQHD IPS display operates at a high refresh rate to reduce or eliminate the perception of screen flicker. This is done by implementing a high frame rate. The input lag is also shortened by as much as possible, and this results in the elimination of flicker, which is a boon for FPS gamers. This display has TUV certified Flicker free panel and Blue Light Filter, so the quality of these features is assured. This LED backlit monitor surpass many monitors of the same price range by a lot of difference in the output quality. The backlighting allows the image generation to be as clear as possible, especially during games when you have dark areas and light areas all at once, moving at a high rate of the frame, and you need accuracy in such a virtual environment. The design is highly ergonomic, with no unnecessary features of uncomfortable port placements. The size of the IPS panel wrapped by a black bezel is 27″WS (68.47 cm), and it weighs 16.1 pounds. There is a light AG coating on the panel, which is an anti-glare coating, meaning that it helps reduce the glaring that causes eye fatigue by implementing matte coating on the screen as it is non-reflective to the user since it diffuses rather than reflects ambient light. The 29.7 x 8.9 x 17.8 inches dimensions are perfect for a table, though it also has a VESA mount capability. Once we assemble the Asus MG279Q their things fit very compactly. There is no cheap plastic used in the building design. The bezel is extremely narrow, making it an ideal candidate for multi-screen setups. The stand is highly adjustable- with 120 degrees swivel, 90 degrees pivot, 25 degrees tilt and 5.9 inches of height adjustability. The cabinet of the display has a total of 4 VESA-mounting holes that are supported by a wedge-shaped base and a mounting arm. Combine all that with 178 / 178-degree viewing angles, and the display pretty much covers all of the major comfort aspects in its design structure. This monitor has a lot of connection support. First off, we have 2x USB 3.0 ports with charging capability, so you can charge your peripherals fairly quickly while you are gaming. After that, you have a standard 3.5mm headphone port located on the downside. If you don’t want to use the headphone jack, you also have two 2-w speakers that function quite well. Then you have the AMD FreeSync support, and DisplayPort, mini-Display Port and two HDMI ports with MHL, two downstream USB ports on the bottom (none on the side, though, which is not a disadvantage but is more convenient that way). On top of all that, the OSD (on-screen display) provides you an option to keep them powered up even when the monitor is off – so you can charge the devices on it without having to keep the monitor on at all times. The OSD is accessible by pressing the joystick and is very quick to use. The color menu has a lot of calibration options, which is appreciated. The design of the OSD is simple, and there are no issues on this side as well. Priced at around $500, this is slightly expensive. So, in a nutshell, the Asus MG279Q is a reliable piece of hardware that offers a lot of comforts and a lot of value for the money to a gamer. 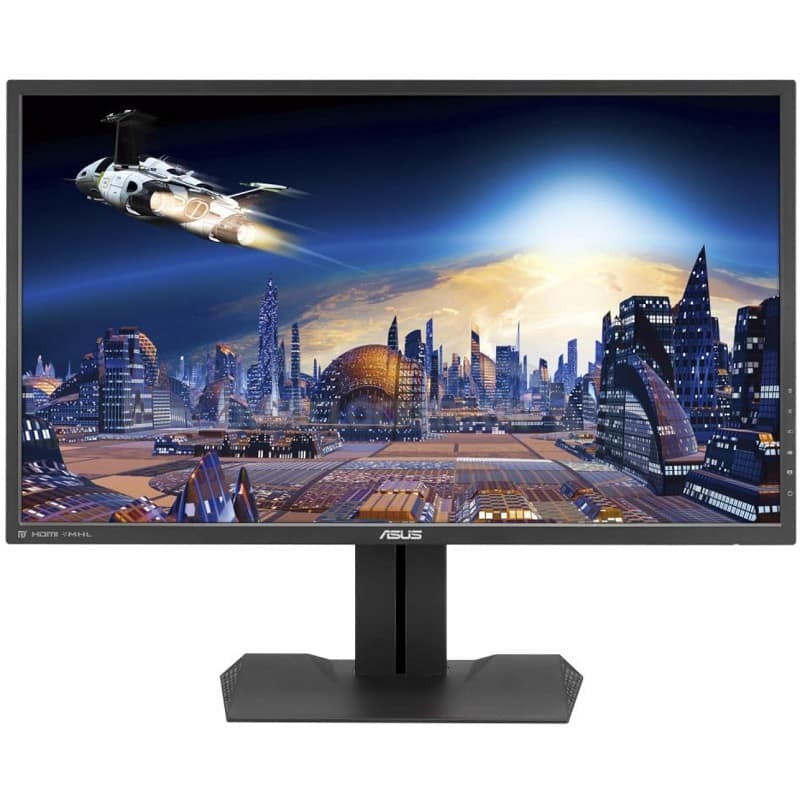 And while other monitors in the same price range might have a couple of features that surpass this one (native resolution for example), this one offers connectivity and comfort in great amounts on top of the already ‘4 stars out of five’ game play. Designed cleverly, this is the monitor for you if you are interested in gaming on Freesync.